I’ll admit it. Choux paste, or pâte à choux used to intimidate me. 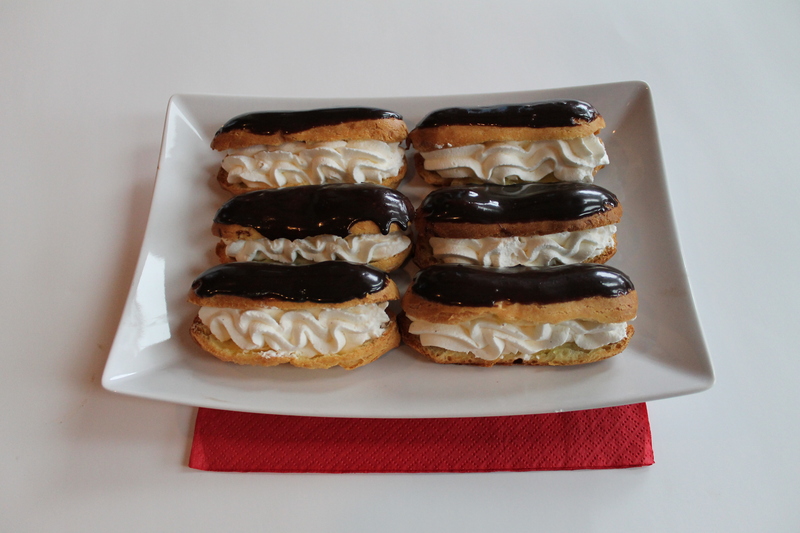 A few years ago eclairs, and cream puffs weren’t in my repertoire. Why?? I do not know. 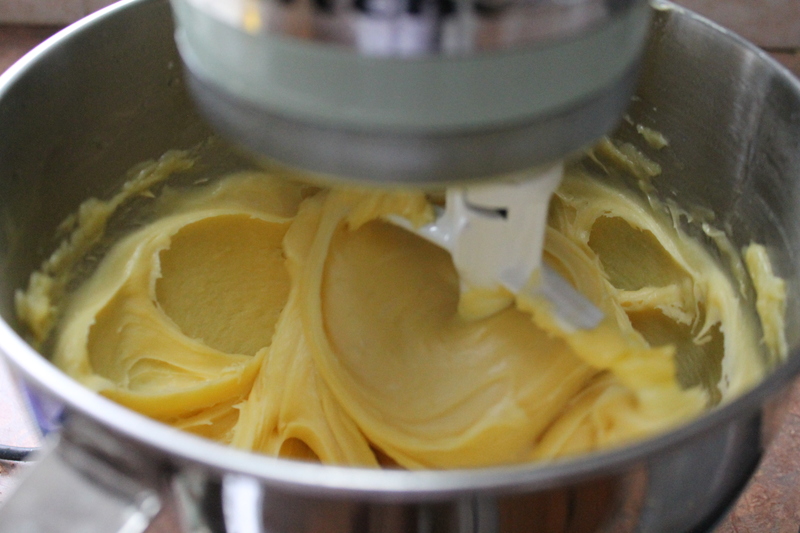 Making choux paste is easy as one, two three. Really! 1. Boil together water and butter. 2. Dump in flour and work your arm till it forms a glutenous ball. 3. Throw it on the mixer while you slowly add in the eggs. Voila! It’s really the baking part that is important… the eggs give the pastry its volume and texture so you want them to get a good even bake, drying out enough to give it a nice crisp shell. Once done they will sound hollow when tapped. Bring butter, sugar, salt, and water to a boil in a medium saucepan. Turn off heat and dump the flour in all at once, using a wooden spoon to quickly incorporate all of the dry flour. Turn heat to medium-high and stir constantly until the mixture begins to form a ball and pulls away from the sides of the saucepan. Transfer the mixture to the bowl of an electric mixer fitted with the paddle attachment. Mix on low speed until slightly cooled, about 1 minute. Lightly beat the eggs and begin to slowly add them in, roughly one egg at a time. Wait until all liquid is incorporated before adding in more. Mixture is ready when it is soft and slack. It should form a soft peak when touched by your finger and feel sticky. Fit a pastry bag with a medium large round tip. Either pipe logs for eclairs or balls for profiteroles. Bake for 15-20 min, until puffed up and golden (rotate pan if necessary.) Reduce oven heat to 350°F and bake for additional 10-20 min until golden brown and crisp. Should be light when picked up and sound hollow when you tap on them. *Note* Careful not to open the oven more than once or twice as you really don’t want any steam/heat to escape, especially in the first round of baking! 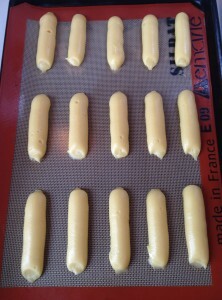 Cool completely and either fill by poking a small pastry tip into the centre or by slicing them in half. 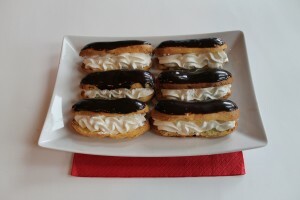 If you’re like me and love classic, dip them in chocolate glaze and fill with Chantilly cream. ENJOY! Enter your email to stay up to date on new products and yummy recipes! Subscribe To Munchies by MASH!